There is a multitude of YA novels out there. Some are nothing exceptional and are just content to ride on the Twilight and Hunger Games hype. But others have well written original stories with believable characters that are a pleasure to read. 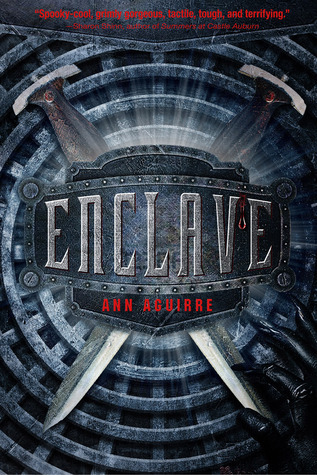 Thankfully, Enclave by Ann Aguirre is one of those. The story takes place in College, an enclave in what later turns out to be abandoned underground tunnels. It is a post-apocalyptic novel, but what exactly happened to the world is not really clear, because several generations had passed since the event. People of the enclave have never been Topside, most of them have never even ventured in the tunnels beyond the barricades. Life in the community is strictly regulated, because supplies are limited. Only those who are strong, healthy and useful are permitted to survive. The enclave is ruled by the Elders, and the population is divided into three very distinct roles: Builders make equipment, cook food and are in charge of the general maintenance of the enclave, Hunters venture in the tunnels to bring back meat and defend the enclave against outside threats, and Breeders well… breed (on a strict schedule) and take care of the young. Life is hard in the enclave and not many people survive past 25 – disease and malnutrition take their toll. I also loved the fact that the author never really says what happened to the world. The reader discovers some hints at the same time as the protagonists, but they don’t care about it that much. For them it’s ancient history and they have more pressing matters to worry about, like survival. And it is absolutely fascinating to see the society the author created. Their values, rules and aspirations might look foreign to us, but in the context of that world they make sense, and that is wonderful. But apart from that, I am looking forward to reading Outpost, the second book in the series and explore a bit more of this world. Previous PostLeviathan Wakes by James S.A. CoreyNext PostOf Broken Things – first draft finished.